Cows in weird places: on of my favourite whimsical posts brought back for you today. So, there were these sailors. And they were floating out there in the Japanese sea, and they had been for some hours. Their boat was gone, and there was nothing for them but the mercy of the deep blue sea. Having cheated death, they were revived and de-briefed. And the moment they opened their mouths to divulge the cause of the shipwreck which had almost claimed their lives, they were summarily arrested. Police took a dim view of their claim that a large cow had fallen out of the sky, there in the Sea of Japan, and that it had struck the fishing trawler on which they were working so industriously. Not that a cow, falling from a great height, couldn’t do some serious damage. If it was small you’re looking at 600-900 pounds – some 42 -64 stone – and if is a biggie, one might estimate 1000 – 1600 pounds, or between 71 and 114 stone. Add to that the velocity of a cow which may have hurtled some distance and you will agree it was enough to scupper a respectable fishing craft. But cows rarely even paddle, except possibly across some country stream to get to their dinner. The location of the cow was highly problematic. 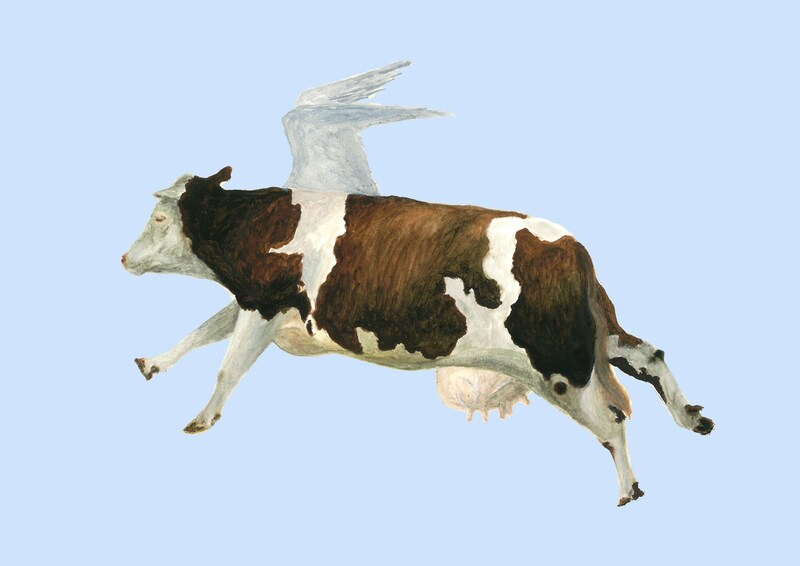 Furthermore, cows are not known for their flying skills. Generally, they are believed to walk wherever they want to go. Occasionally, the farmer will give them a lift up the road. But that’s the extent of their travel options. Two weeks after the fishermen were arrested for their tall tale,, their fortunes were reversed in a resolution, courtesy of the Russian Air Force. Beef is a coveted commodity the world over. Its storage, however, especially on long haul flights, can be tricky. A number of members of the air force had conceived of a new, improved way to transport beef. Just fly the cow. But they failed to foresee one thing: cows are really awful fliers. They start to hyperventilate the moment they get into First Class. They are all staring eyes and “Oh,no, I’m going to die”. Every airplane disaster movie you have ever seen plays on the inside of their enormous cow retinas. All attempts at meditation and relaxation on behalf of the flight crew fall on deaf ears. Cows on planes spread panic and despondency. And they can’t sit still. By the time the plane was airborne the cow was on Planet Panic, lumbering around the aircraft. It was a life or death situation.They reached 30,000 feet; they opened the hatch, and jettisoned it, sacrificing one for the good of all. And they did this just over the Sea of Japan. Unusual things have been dropping out of the sky since the world was young. Fish, starlings, worms: they’ve all had their moments. But there is usually a perfectly simple explanation. My favourite deluge with a difference purportedly happened in a little area of outstanding beauty in Russia, called Meschera. It rained money: but not your common-or-garden roubles. The deluge, in mid-June 1940, consisted of coins from the 16th century. State archaeologists were brought in to examine the finds; the best explanation they could come up with was that a storm had lifted a find which had been exposed by soil erosion. Since I first published this post, it has become clear these stories are pure urban myth, more fairytale than reality. But what a set of cracking yarns! Next time you cast despairing eyes up to those burgeoning skies, remember these cautionary fairy tales, and have a care. An umbrella simply may not be enough. Posted in WhimsyTagged coins, japanese sea, Russia, sailorsBookmark the permalink. how can you tell if a roof is cow-proof? I know. Thinks: thanks, Russian airmen. Then there might be some truth to “the cow jumped over the moon”! If Russian airmen have anything to do with it, Madhu, yes! I hope my mad cow flyer brings mucho dinero. Maybe a little Lucy in the sky with diamonds would make a nice windfall. Easy to love, cows falling out of the sky: unless, of course, you happen to be the one in its path. What an awesome story! poor fishermen, no-one believing that they saw what they saw! Things falling out of the sky are only really noticed when they land on someone, I guess. They certainly are, Lexy 🙂 Did you check out Penny’s story? It came in after your comment – a pumpkin decimating a farmhouse kitchen! I wonder if the insurance men paid out for that one? How remarkable that a cow jettisoned over the vast ocean would land on a fishing vessel. Not at all! I published it as fact first time round….the sort of story one would love to be true. Dear Kate, thus the song “Pennies from Heaven”! Peace. You’re right there, Dee! Peace to you too. I love this. I may have mentioned this before, but, some years ago, two skydivers got the brilliant idea of passing a pumpkin to each other while floated down to earth. They were in the middle of an Illinois cornfield when they decided to play catch, assuming, I imagine, that no harm could come from their playfulness. Of course, one toss was missed and down the pumpkin plunged at such a speed that it crashed through a farmhouse kitchen, splattering pumpkin all over the place, and, well, you can imagine what the woman of the house thought as she was sipping her morning coffee. I love this story, Penny 😀 I would have given anything to talk to the housewife. So cows now qualify as falling space debris? Neat. I’m not surprised that credibility was somewhat stretched at first. I would have been tempted to have invented a freak wave rather than tell THAT truth! There’s the story of the sky raining frogs or something; I think they included it in the film Magnolia. Then there’s the diver found up a mountain or something, having been scooped up and transported. There are lots of these stories but they are all fun, so it’s no wonder. Cows not only walk, they run. When I was in college in Vermont, I had the opportunity to observe Holsteins at full gallop on more than one occasion. Hilarious.